When you think of making a quiche, you may have a few things come to mind: time consuming, complicated ingredients, carby crusts, etc. Not your idea of an easy keto meal, right? Well get ready for one of the easiest “quiche” recipes that is both satisfying and vegetarian friendly! 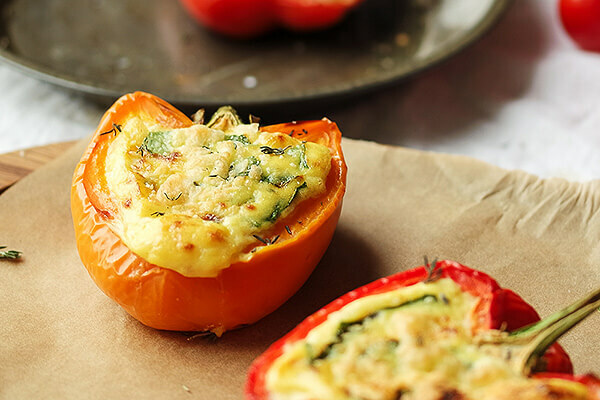 These cheesy quiche stuffed peppers are an easy brunch or an even easier dinner. A lightly seasoned egg filling is made fluffy with the mixture of full fat ricotta, mozzarella, and the bite of shredded Parmesan. Just a few leaves of fresh spinach are needed to give a little green boost to these beautifully colored peppers! The steps are so simple that you can throw this together and have it in the oven in minutes. 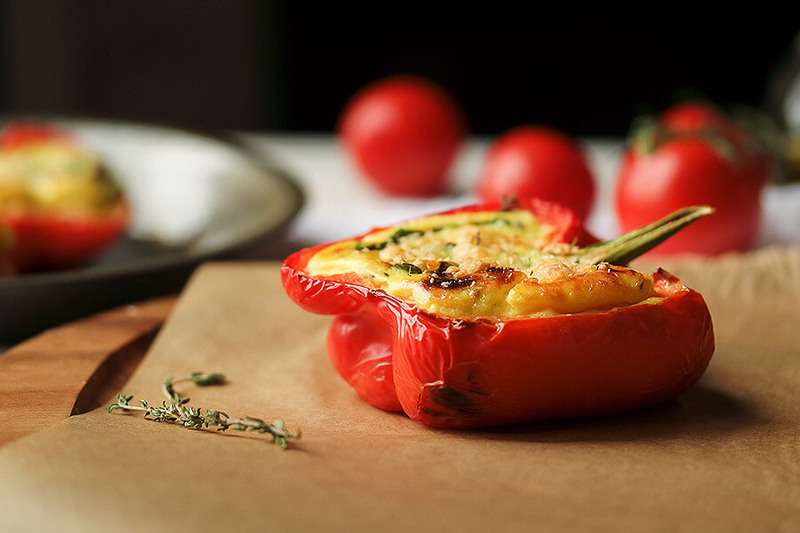 Simply blend the filling and pour it into the prepared peppers, cover with foil, and bake. They are great to reheat the next day too. The variations that you could whip up are endless. Any low cab veggies or fresh herbs could be added, and if you aren’t a vegetarian then bacon is a popular option! 1. Heat oven to 375°F. Prepare the peppers by slicing them each into equal halves. Remove the seeds. 2. 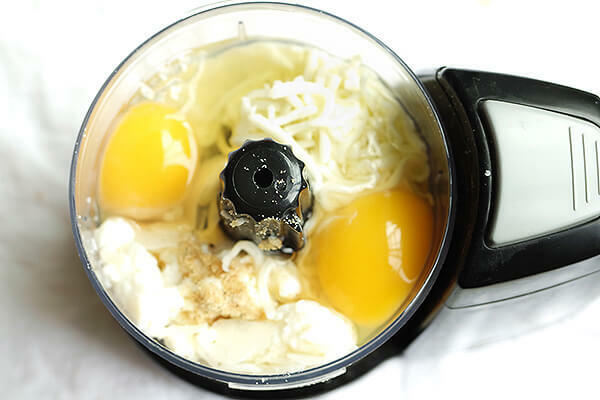 In a small food processor blend the three cheeses, eggs, garlic powder, and parsley. My food processor is smaller than I would like so I did this in two batches, half and half, and then combined both fillings. 3. Pour the egg mixture into each pepper, filling just below the rim. Place a few baby spinach leaves on top and stir with a fork, pushing them under the egg. Cover with foil and bake for 35-45 minutes or until the egg is set. 4. Sprinkle with Parmesan cheese and broil for 3-5 minutes or until the tops begin to brown. 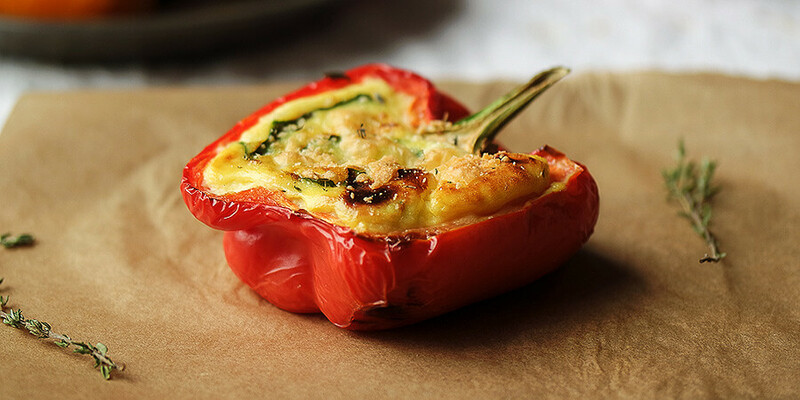 This makes a total of 4 single-servings of Vegetarian Three Cheese Quiche Stuffed Peppers. Each serving comes out to be 245.5 Calories, 16.28g Fat, 5.97g Net Carbs, and 17.84g Protein. Heat oven to 375°F. Prepare the peppers by slicing them into four equal halves and removing the seeds. In a small food processor blend the three cheeses, eggs, garlic powder, and parsley. My food processor is smaller than I would like so I did this in two batches, half and half, and then combined both fillings. 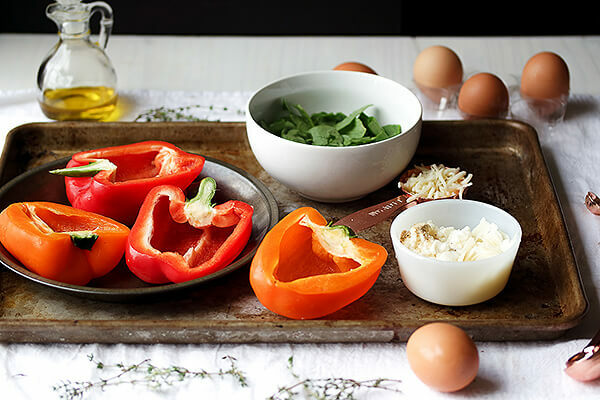 Pour the egg mixture into each pepper, filling just below the rim. Place a few baby spinach leaves on top and stir with a fork, pushing them under the egg. Cover with foil and bake for 35-45 minutes or until the egg is set. 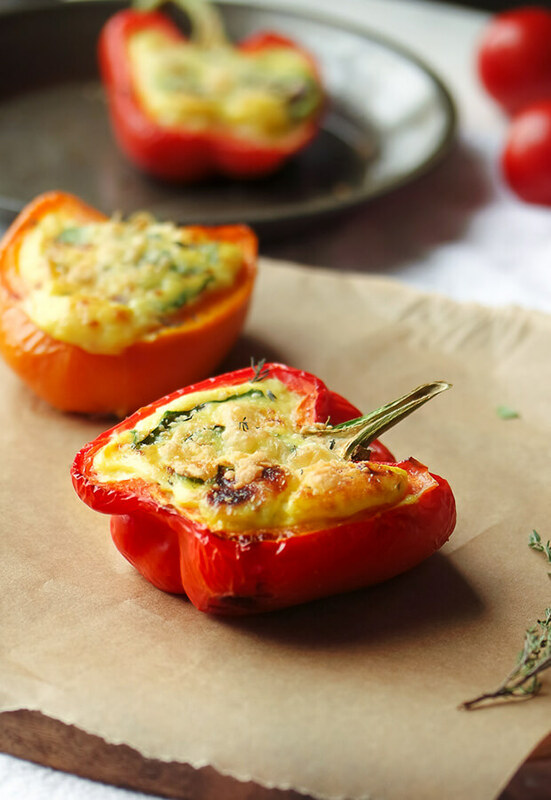 Sprinkle with Parmesan cheese and broil for 3-5 minutes or until the tops begin to brown.